Jordan Peele’s directorial debut “Get Out” was an Oscar-winning horror masterpiece. So how does his sophomore effort stack up? Few directorial debuts were as shattering as Jordan Peele’s Oscar-winning horror flick “Get Out” (2017), which not only won Best Original Screenplay, but should have won Best Picture (Rewriting Oscar History). It stands as a masterpiece of cultural significance and cinematic artistry, repaying on repeat viewings with enough double meanings to fill a film theory class. 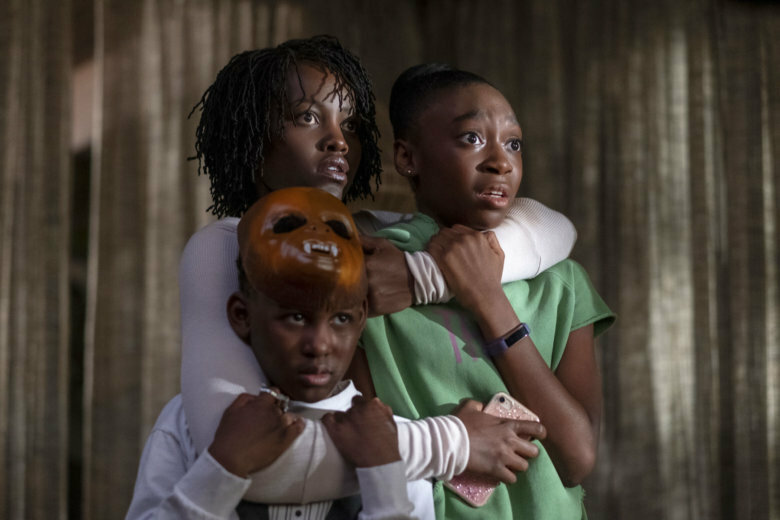 Thus, we get the eager anticipation and unrealistic expectations of “Us,” which again boasts powerful performances of tear-stained cheeks, stunning technical prowess with symbolic imagery and “sunken place” social satire. This time, however, its surface-level plot piles the “gory” on the allegory, straining its metaphors with logical inconsistencies beneath the twists. The story opens with Young Adelaide Wilson (Madison Curry) wandering off from her parents and suffering childhood trauma at a boardwalk fun house in Santa Cruz, California. Decades later, grown-up Adelaide (Lupita Nyong’o) and her husband Gabe (Winston Duke), take their kids, Zora (Shahadi Wright Joseph) and Jason (Evan Alex), on a return trip to Santa Cruz, but their family vacation turns chaotic when dangerous doppelgängers appear in their driveway. The dual personas provide a powerful stage for Nyong’o, who deserves Oscar consideration for Lead Actress six years after her Supporting Actress win for “12 Years a Slave” (2013). She essentially has to play two roles: one as a traumatized middle-class mother, one as a hoarse-throated shadow figure, but both with protective maternal instincts. You’ll instantly recall Daniel Kaluuya’s teacup hypnosis as Nyong’o keeps her eyes “Peeled” in bulging, teary terror. The same goes for Duke (“Black Panther”), who dons a Howard University sweatshirt and glasses to crack goofy dad jokes, then shifts to farsighted squints and primal moans as his shadow double. Most impressive are the child actors, as Joseph plays teenage innocence before shifting to a freaky frozen grin, and Alex playfully wears a plastic Halloween mask before shifting to his pyromaniac duplicate to wear a much creepier, canvas-style mask. Peele was inspired by the “Mirror Image” episode of “The Twilight Zone” (1960), which he is rebooting this spring. Cinephiles will also notice shades of Don Siegel’s “Invasion of the Body Snatchers” (1956), Michael Bay’s “The Island” (2005) and Charlie McDowell’s “The One I Love” (2014), which fittingly starred Elisabeth Moss (“Mad Men”) in a double role. She returns in “Us” with Tim Heidecker (“Tim & Eric Awesome Show, Great Job!”) as the wealthy parents of twins. Directing duplicates requires a carefully constructed dance of body doubles and over-the-shoulder trick shots — just ask Tatiana Maslany in BBC’s “Orphan Black” (2013) and J.K. Simmons in Starz’s “Counterpart” (2017). But it’s worth the challenge, as it provides endless possibilities for dynamic direction. In “Us,” Peele presents Nyong’o’s face pressed against her reflection in the cracking glass of a coffee table, a high-angle shot of the family on the beach with long shadows stretching across the sand, and the distorted images of funhouse mirrors. The latter-most is the most disturbing in a masterful opening boardwalk sequence, where Peele blends the whistling child danger of Fritz Lang’s “M” (1931) with the beach terror of “Jaws” (1975), right down to Jason wearing a “Jaws” T-shirt (Peele reportedly asked Spielberg for permission). The fact that Young Adelaide wears a Michael Jackson “Thriller” T-shirt is even creepier after the King of Pop’s pedophilia allegations in HBO’s “Leaving Neverland” (2019). Note the way that Peele constructs this sequence: (A) Young Adelaide’s face moves from light to dark (i.e. film noir), as she descends the stairs to the beach; (B) Lightning eerily flashes in the night sky in the distance; (C) An insert shot shows a candy apple abandoned in the sand as a few rain drops start to fall; (D) The rain lets loose in a downpour as Young Adelaide stands alone in the chiaroscuro-lit doorway of the fun house before plunging into a dark hellscape. The film’s next big set piece, the home invasion by the doppelgängers, is equally masterful, playing on the same fears of intrusion as “Night of the Living Dead” (1968), “The Evil Dead” (1981), “Scream” (1996), “Funny Games” (1997), “The Others” (2001), “The Strangers” (2008) and “The Purge” (2013). This is where you’ll clutch your date on the edge of your seat. And then, the film’s tone frustratingly starts to shift, becoming less of the slow-burn suspense we got in “Get Out” and more of the lowest-common-denominator schlock we’ve seen from zombies and vampires of monster movies past. Act 2 still offers moments of bloody delight and inspired choices, particularly a bubbly soundtrack that runs counterpoint to the grisly action, like Kubrick’s use of “Singin’ in the Rain” in “A Clockwork Orange” (1971). Here, it’s the Beach Boys’ “Good Vibrations,” which cuts to a hilarious Alexa joke that we refuse to spoil. Not only does the tone shift, the “rules of magic” slowly start to unravel with plot holes and logical inconsistencies that undermine the otherwise brilliant twists of Act 3. For instance, why do some dopplegangers move in unison with the humans (i.e. the son), while others are able to move freely? By the end, their exact origins remain sketchy even after the ultimate reveal. The entire construct feels half-baked and not fully formed. By the time we reach the White Swan vs. Black Swan ballerina showdown a la “Black Swan” (2010), we wish that Peele would have given the script another rewrite or two to flesh out the story logic. While “Get Out” sent us out of the theater in awe, many viewers will leave “Us” scratching their heads in confusion. This larger social commentary is timely, exposing the class divides of two parallel worlds, one of privilege, one of plight, unfolding in simultaneous realities. And yet, like Darren Aronofsky’s “mother!” (2017), the underlying metaphors never fully gel with the surface-level A-story plot, which is what “Get Out” did so well, marrying the surface ride with the hidden symbolic layers. Alas, you can’t hit a home run every time. “Us” is still very much worth a watch — a genius firing on most cylinders is a better use of your time than lesser filmmakers at their best. Just expect a suspenseful, nightmarish, even puzzling ride with more questions than answers. I have a hunch audience scores are going to be more mixed than the critical raves thus far. What we have here is M. Night Shyamalan after his “Sixth Sense” breakthrough akin to “Get Out.” Plenty of juicy twists await, but can anything ever match it? Either way, it’s exciting to have a new auteur in the horror genre where we can’t wait to see what he does next.